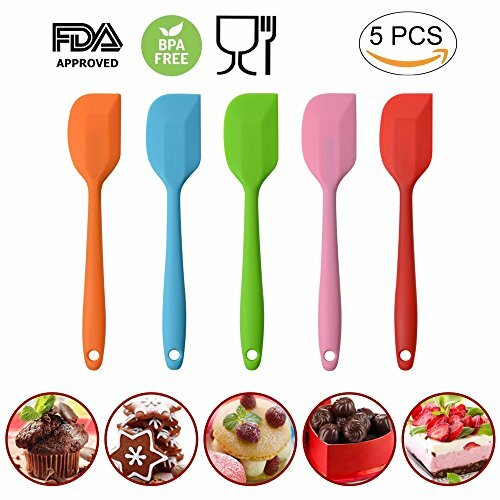 BPA FREE & HEAT-RESISTANT--The spatulas are made of BPA Free and food-grade silicone, perfect for coated & non-stick cookware and healthy to use. Heat resistant up to 500 F degrees, safe for use with hot foods and around the cook top and dishwasher safe. NICE to USE -- The little spatulas work well from the small jar to the large mixing bowl and are invaluable in your kitchen. Perfect for stirring, scraping, and folding a wide variety of foods and no seams or cracks to trap food and bacteria. They are baking essentials. ONE-PIECE DESIGN with STAINLESS STEEL INSIDE - The whole spatula is seamless design. Coated with soft silicone and stainless steel inside, the handle is nice and firm to hold. These utensils will hold up to the demanding use of home cooks and professional chefs. CONVENIENT DESIGN - There is a hanging loop on each end of the spatulas for easy carriage and storage. Also you can hang it up after clean it make it dry fast.Clean up easy and keep your food safe. The size is also perfect for children to help you doing the job. FOREVER WARRANTY - Our promise is a superior experience for everyone who owns our award-winning MOACC products. We\'re here as a trusted partner, so you can enjoy your purchase with full confidence knowing that our warranty lasts forever. A must have kitchen item!